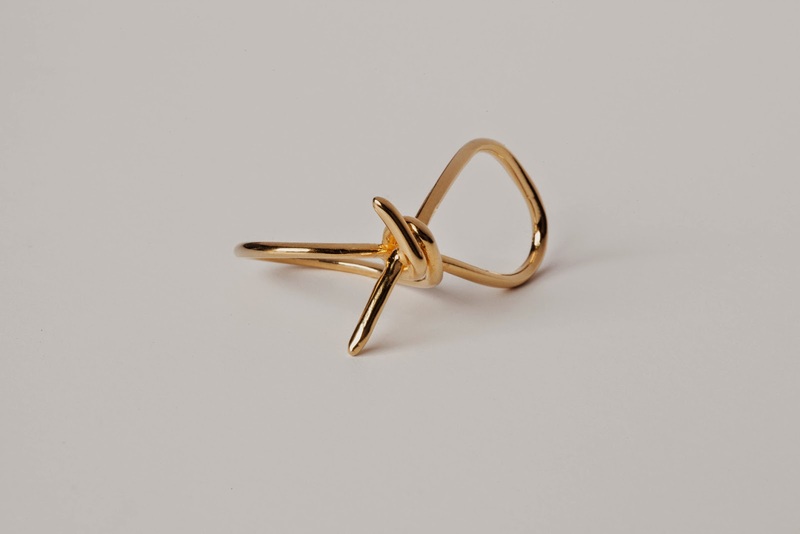 I'm in love with this memory knot ring from Of A Kind - a New York-based online retailer specializing in one-off, limited editions from independent designers and artists. 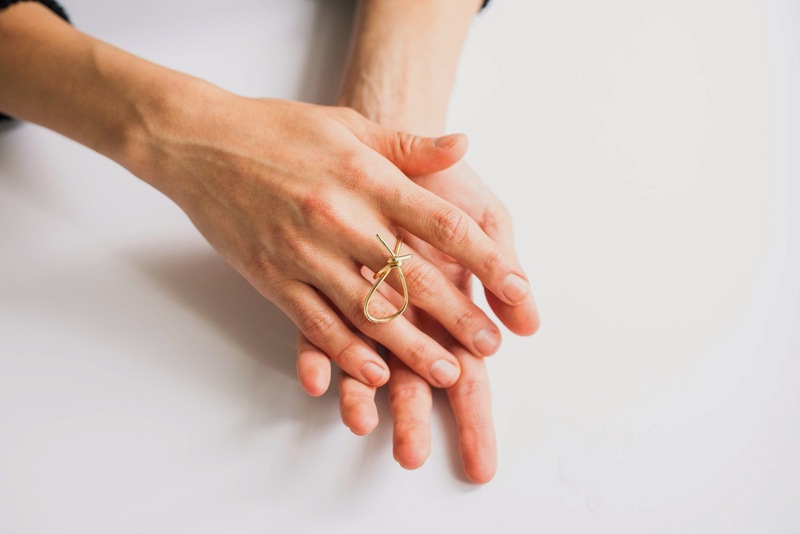 This particular ring is is a result of a collaboration between artist Orly Genger and jewelry designer Jaclyn Mayer and it's stunning: simplistic but exquisite at the same time. I particularly love the oversized knot. 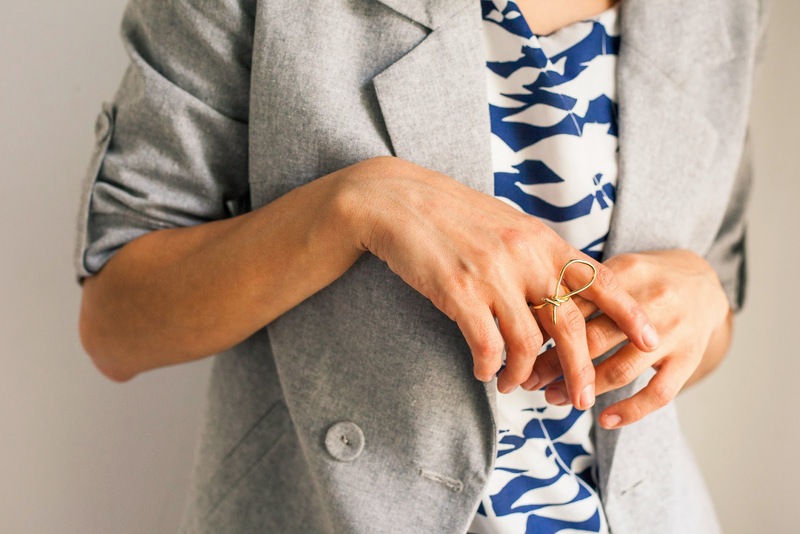 While other gold bow or memory knot rings are dainty and sweet, there's something irresistibly, unapologetically carefree about this loop, which spans 1.5 inches, according to the website. And yet in contrast, the knot itself anchors the loop - lending it both stability and assurance (can you tell I've thought way too much about this?). And in many ways, this ring reminds me of my wonderful grandmother who, before a massive stroke rendered her speechless and virtually lifeless, used to sit down with me for little chats in her Hong Kong apartment, which was directly across from the Hong Kong Jockey Club in Happy Valley. One day, I showed her a pair of earrings I'd bought from Causeway Bay. "What do you think of these, Mar Mar?" I asked, addressing her in the affectionate form of (paternal) "grandma" in Cantonese. She considered them for a long minute before finally answering, "Ah Mar doesn't know anything, my opinion doesn't count! As long as you like it, that's all that matters." She patted my hand. I always marvelled at how her hands, though wrinkled and gnarled from arthritis at the age of 88, could feel so soft and cool. Sometimes, I'd sit and hold her hand while we watched a Cantonese soap opera together, and it would make me want to cry. I pressed her for an answer. "But do you like them?" Her expression was pained. She hesitated before saying again, more emphathetically, "I don't know the trends nowadays with you young ones. I'm old and useless. As long as you like them, that's what's important." Now, I was amused. "Come on, Mar Mar!" I cajoled. "Tell me what you really think!" "Well," she said, tentatively. "I think they look like ... like ... some crumpled up wire." She looked extremely apologetic when she said this, worriedly knitting her eyebrows together, and seemed surprised when I threw my head back and laughed. She pushed herself up from the leather couch we were sitting on and waved her hand in the air as she got up. "But don't listen to me! My opinion doesn't count." This ring reminds me of that memory. I can see my grandma, being pressed for an opinion on this ring, saying in that sweetly apologetic tone, "It just looks like a piece of wire." It reminds me of how loving and generous my grandmother was - always careful to never hurt anyone's feelings, always putting others before herself, and always lavishing her family with everything she owned, while living a very simple life herself. I remember the jewelry she wore when we'd go out for dinner, which reflected none of her wealth - a pair of simple pearl earrings and a very small, gold watch. I felt so proud of her in those moments, contrasted against sharp, red manicured talons and very ostentatious displays of money from other members of my far-reaching, extended family. She'd cook elaborate meals for us that took hours - even days - of preparation, before serving herself a humble bowl of rice and a small piece of fish when it finally came time to eat. She remains, to this day, my ultimate heroine - my feminist icon, my beauty icon, my every kind of icon. And this ring reminds me of her. All photos from the Of a Kind website. Thank you, Gianni! She is graceful and kind. I admit that it was really difficult for me to write this post without getting choked up! And as usual, you've hit the nail on the head re: opinions. I miss that enduring and kind humility my grandmother could so easily express - and yet, something that so many of us (myself included) struggle with. What a beautiful post, and thank you for sharing something so personal. And now I have to ask the obvious and superficial question: Did you buy this ring? You should! Aside from the fact that it's beautiful and that you'd be supporting an independent designer (which is always great), it's also a piece that would truly mean something to you. Officially giving you permission to buy! I have visited a immeasurable computing machine but you are the simplest that I even have ever seen, its very awful. Celtic engagement rings supply a singular vogue and temperament that cannot be found on alternative fashionable ring styles. Celtic rings contain terribly ornate and delightful, Byzantine styles that symbolize commitment and love. Solitaire engagement rings speak for themselves. And it's also a natural progression that partners choose from amongst our range of Celtic wedding bands and solitaire engagement rings as soon as they elect to get spliced. Not only that chances are the most people will have no idea who the designer is of a certain ring they will definitely notice you have a unique one of a kind ring! Its extremely awful, that is the blog you admire I likeable it. I have conjointly this related website. Celtic rings symbolize love, happiness and life. Celtic rings figuration one thing thus vital ought to be factory-made in a very metal that's as sturdy because it is gorgeous.